Sandhill Cranes are migratory birds and they spend the winter months in warmer climates in the southern part of the United States. Adults are grey; they have a red forehead, white cheeks and a long dark pointed bill. Their light-footed mating dance, with wings spread wide, is ancient avian ballet and their calls are like the trill of a distant French horn. 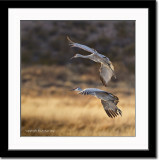 The images on this gallery were captured at two separate locations, near Lodi, California and at Bosque del Apache National Wildlife Refuge, New Mexico. I spent a few days in Lodi along Woodbridge Road and nearby fields since one of our offices is located in nearby Stockton and had the chance to capture these birds under more various circumstances. Our stay at Bosque del Apache or "Woods of the Apache," for the Indians that camped in this riverside area, was too short. This famous birding spot lies along nine miles of the Rio Grande River in south central New Mexico. Although the area is in the desert, the refuge land along the river is lush, an oasis in an otherwise inhospitable area. Cottonwood trees, willows, wetlands, and meadows combine to create a magical place, a place the hundreds of thousands of birds call their winter home. Photographic tidbits: After foraging in nearby fields, sandhill cranes arrive in flocks to roost and spend the night in wetlands to deter predators, such as coyotes. At dawn they take off again to feed. You can observe this pattern at their roosting spots and this pattern provides plenty opportunities to capture them. Update in September 2011 - Except for two images, I re-did the entire gallery. I am trying to limit images in this gallery to only 16 in no particular order. How many images of sandhill cranes can one handle in a single gallery anyway LOL? Thank you for visiting and please feel free to leave feedback on images or the gallery you see fit. Great gallery! I was at Bosque the last week of November and the weather wasn't all that great. Looks like you had a great time.